Once in a while you just have to pack your bags and get out of the city. I had booked the Lake Louise Inn with a groupon a couple of months ago with the hopes of taking the kids and dogs and immersing ourselves in a winter wonderland. Well that dream ended when each of the kids decided they had better things to do than hang out with mom and dad. And so, we ended up driving to Lake Louise Friday night by ourselves. It’s not that big of a disappointment (honestly!) because we rarely get away on our own…ever! Since we had to leave Friday night I decided to try and make a reservation in Canmore so that we could eat dinner on the way through. We’ve tried several times to get a table at Crazyweed but each time it was either booked up or just closing. Finally with a bit more forethought on my part we were able to score a table for two. We pulled into the parking lot about 6:30 and walked in to find the restaurant filled to the brim. Service was in full swing and the volume level was way up there. I was a bit surprised because I was under the impression it was a low key, more reserved place. For an establishment such as this, I was surprised at the amount of kids present. After we were seated, we were totally surrounded. I don’t necessarily have a problem with kids, especially well behaved ones but I was expecting our dinner to be a bit quieter. Maybe if our kids were with us I might have appreciated the ‘lively vibe’ in the room a bit more. I think the high ceilings and large windows really serve to amplify the acoustics in the building and this is off putting if you are expecting a nice dinner out with your significant other. BUT I have to admit, those huge windows also give way to a great view of the surrounding mountains and provided a lot of natural light so I could take pictures. Everything on the menu looked so good I had a really hard time deciding what to order. 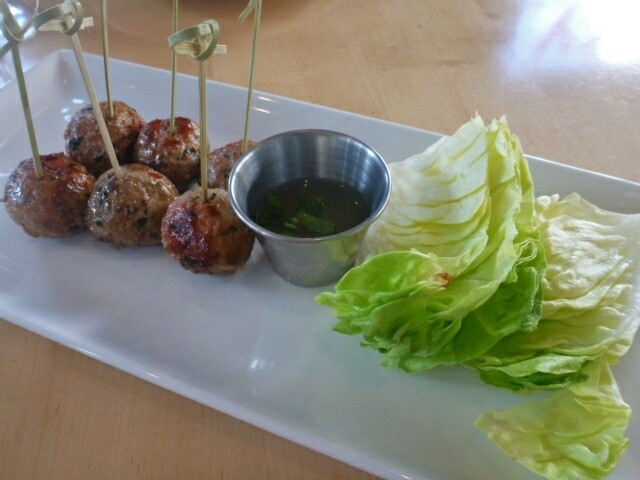 We finally decided to share the Vietnamese Pork Meatballs. They come with a chili-lime sauce and you can wrap them in the bits of accompanying lettuce, then dip them in the sauce. This small dish was the only disappointment of our meal at Crazyweed. I found the meatballs to be way too full of garlic and lemongrass. The sauce was really unbalanced so that when I dipped the meatball in, it was disproportionately acidic. Sweet, sour, salty, spicy, with a smidge of umami. The formula for a good sauce. Fortunately, the rest of our meal was out of this world. I did have a peek at the online menu before hand and one dish that had really caught my eye was the Truffle and Mushroom Gnocchi. Unfortunately, hubby decided that he was going to order that very dish and I have a rule that dictates that we order different dishes no matter what. So, back to the menu I went. I could have had the Moroccan Chicken or the Mushroom Polenta or the Duck Breast. In the end I had to let hubby decide for me and that in itself was a first. While we were waiting for our mains, we enjoyed freshly made Ciabatta with sundried tomatoes. We each ordered a glass of wine to go with our mains. Mine was a lovely Ex Nihlio Pinot Gris with a nose filled with strawberry jam. It finished with a bit of a grassy afterthought. Hubby tried to order Riesling but I thought a Pinot Noir would compliment the woodsy taste of his mushrooms and truffles. 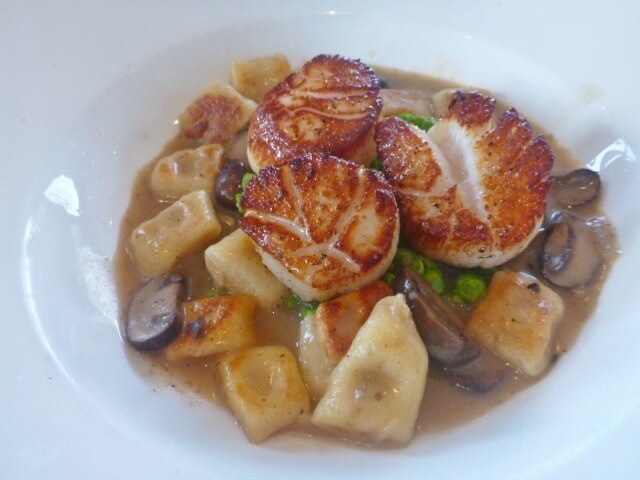 The gnocchi was house made and it came with three large scallops and some ‘mushed peas’. Mushy peas as stated on the menu was a bit of a misnomer. We were kind of thinking they would be a bit more ‘Brit style’. Instead they were more like green peas, slightly smushed. Hubby said the gnocchi was a bit on the heavy side, but the sauce was really nice and not too overpowered by the truffles. When I made gnocchi at home, it was a lot fluffier but it did look a lot like the gnocchi hubby was served. I was a bit embarrassed to post a picture of mine because of how they looked, but quite possibly that ‘rustic’ look holds a lot of charm. What do you think? The huge scallops were beautifully seared but not overcooked. Hubby had a huge smile on his face as he ate them. As a chef, what more could you want? My dish, personally picked for me by hubby, was the ‘gluten free’ option on the menu. Pan roasted Steel Head Trout with roasted baby potatoes, horseradish arugula cream, pickled mustard seed and double smoked bacon. 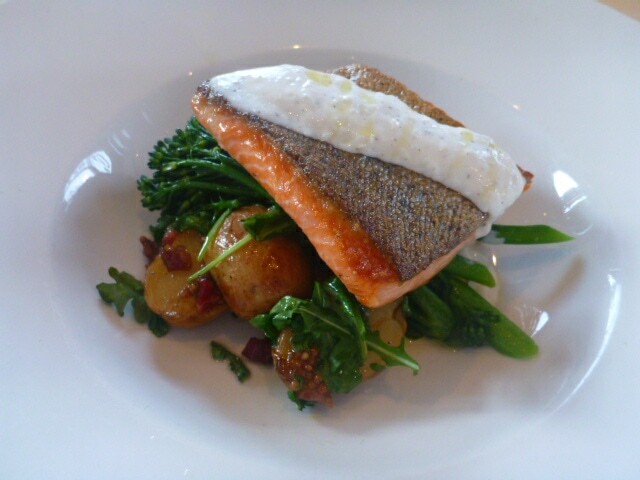 It also included broccolini which to be honest is not my favourite vegetable. Everything was cooked perfectly and I loved the contrasting flavours of the horseradish cream, Trout, mustard seed and bacon. The mustard seeds gave a sweet and acidic kick to the dish and they also ‘popped’ in my mouth as I ate them. 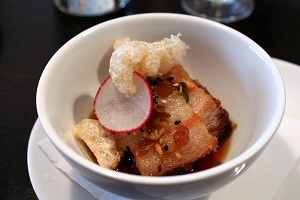 That bacon was also really amazing and I would order the dish again in a heartbeat. Who needs gluten? We happily found the portions small enough that we had just enough room for dessert. 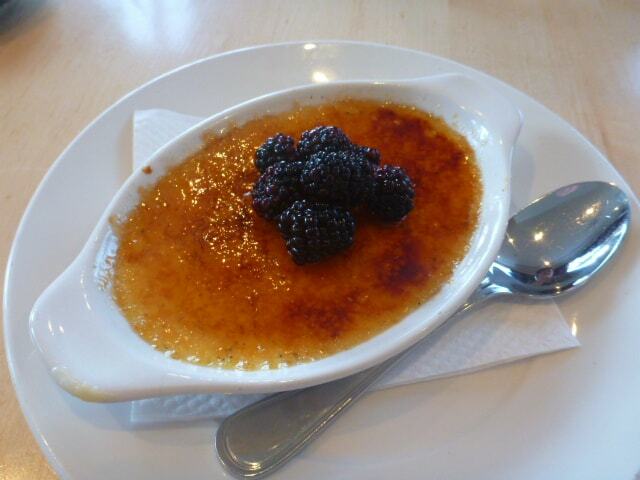 Another rule of mine is that if there is Creme Brulee on the menu, I am definitely going to order it. Hubby usually seems content to order something else and have a couple bites of my brulee but tonight he broke rule number one. He ordered the Vanilla Bean Creme Brulee as well. It was kind of nice that we were both equally happy with our desserts. They arrived with a healthy top layer of burned sugar topped with blackberries. The dishes left our table as clean as could be. I don’t think they even needed to run them through the dishwasher. I can’t wait to go back to Crazyweed. It is definitely a good sign when I can’t decide what to order because EVERYTHING looks good. 1600 Railway Ave., Canmore, AB.